Onni Tommila (l) and Samuel L. Jackson (r) in a scene from Jalmari Helander’s Big Game. Coach Carter would have been a significantly better movie if it was a lot shorter. That may be the primary concern, shortly followed by it coming off as “just another sports biopic”. It’s about Ken Carter, who became the basketball coach at his old high school, Richmond High. It’s one of the worst places to send your kid – at one point, the principal of the school (DENISE DOWE) mentions that the school scored a “1” on a performance report scored out of 10 and on average, only half of their students are graduated. The neighborhood is awful – students are 80% more likely to be arrested than attend college. On his first day, Carter hands out a contract: his team will sit in the front row of all their classes, achieve and maintain a 2.3 GPA (The equivalent of a C+ or the high seventies, and 0.3 points higher than the state mandate for extracurricular activities) or suffer the consequences. He sees a team that doesn’t do their schoolwork and generally disrespectful towards authority figures. The issues in their personal lives are depicted throughout the film and are quite sudden, including Kenyon (ROB BROWN) consulting with his girlfriend Kyra (ASHANTI) on how to deal with her pregnancy. The initial results are immediate – the team begins to win more games through Carter’s no-nonsense regime. But soon, Carter discovers that there are several students failing to meet the grade requirements. In a heavily controversial decision, he benches the whole team and locks up the gym until their studies improve. It’s all rather interesting on paper, particularly because it is based on real events that occurred in Richmond, CA in 1999. Carter is portrayed by Samuel L. Jackson, who brings his usual fiery passion into his role, bringing life into otherwise generic speeches with the typical dramatic music swelling in the background. Jackson also does well in more personal scenes, including the ones where Carter interacts with his son Damien (ROBERT RI’CHARD), who wants to transfer from a private school to Richmond High in order to play for his father. The main problem with Coach Carter is its slow pacing. Clocking in at 136 minutes, I have a hunch that you could spend at least 20 of those minutes out of the room and not miss any major plot points. There was simply too much padding for its own good. The script, written by Mark Schwahn and John Gatins contains too little originality within the genre. If you really like sports biopics, you’ll like this one, because it’s like nearly every other one ever made. The technical execution of this ordinary script is hit and miss. The scenes shot during games are very well done. It’s vivid and sharp. But the musical score, when not backing a big speech, is barely noticeable, and the cinematography is flat, rudimentary, and lifeless. Coach Carter is a movie that will do well in touching some people and boring others, but I don’t think anyone will see it as a complete failure. There are too many commendable aspects of the film to dismiss completely. It’s just that its flaws are too large to go unnoticed. 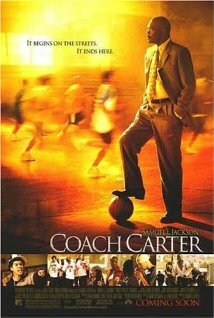 A good movie can use its positive values to distract the viewer from its flaws, but Coach Carter is just too run-of-the-mill to stand out as anything special.